There was a crispness that you could walk right into – and I did. The cold air caught in my throat and I swallowed winter. The ice glistened in a sunny day that couldn’t quite touch the chill. As I walked my ears were met with the tales chickadees tell one another in the hush of the day. 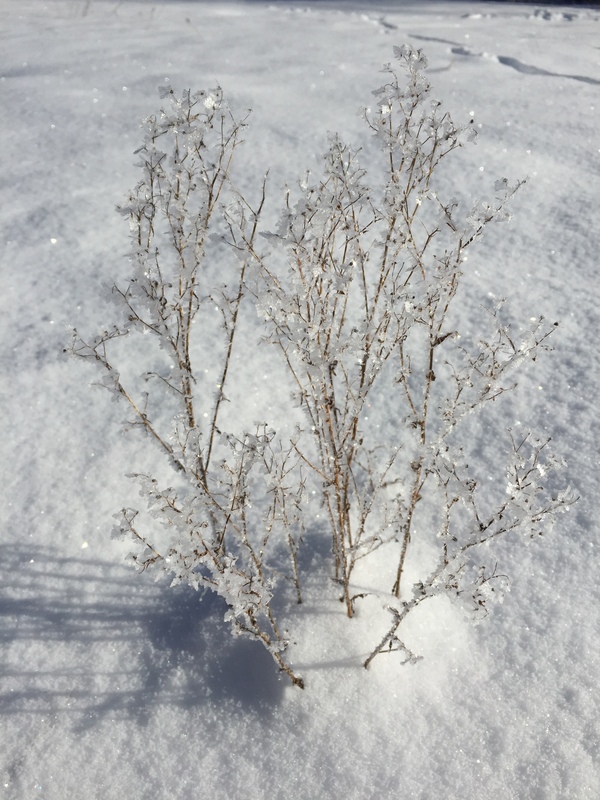 The quiet was broken by my steps crunching into the crusted-snow and a sudden trill call from a pine branch. I spied the source of the sound and my eyes ate the red squirrel scolding me. “Oh, am I disturbing your breakfast?” Did that squirrel nod before going back to the important business of scurrying up and down the tree? I thought so. I observed the squirrel for a few more moments as she searched for food at the base of tree. 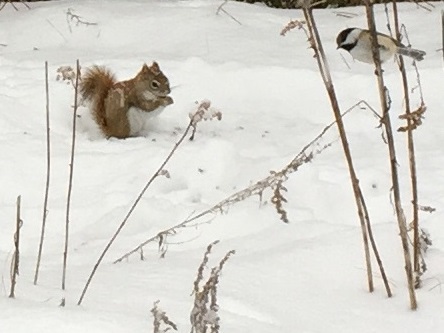 I walked and pondered about how the squirrel can actually smell nuts buried beneath the snow. That’s a powerful nose! I meandered off trail. I wouldn’t quite say it was a lazy day – I was exercising and spending time outdoors after all. Heart pumping blood that I could then taste on the roof of my mouth, my body arching into the wind, only partly accepting the reality of COLD. But it certainly was a good day; a day when the mind could just wander through the hemlock and downed beech limbs. I returned from my walk and picked up kindling in the yard, dropping thoughts like too many sticks that I could no longer cradle. Where did that not-so-lazy day go? The day where I spent the morning in the woods tracking my wild neighbors after hanging up my laundry to freeze dry? I can get so caught up in the daily ritual of the workday: waking up to the alarm, getting ready for work, scraping the car windows, driving to work, walking to my office, working, taking my wellness walk, working, walking to my car, running errands, driving home, eating dinner, reading or watching a video, going to bed, falling asleep, only to wake up again to the alarm the next morning. This daily week-day routine doesn’t give me the time to pause and reflect; to just simply be; be a part of the woods and field I meander through. Of course having a job pays the bills – that’s why we have them – to get the money we need to pay for the things we need – food, heat, clothing, shelter, electricity. Would I really want the life of the coyote I track? 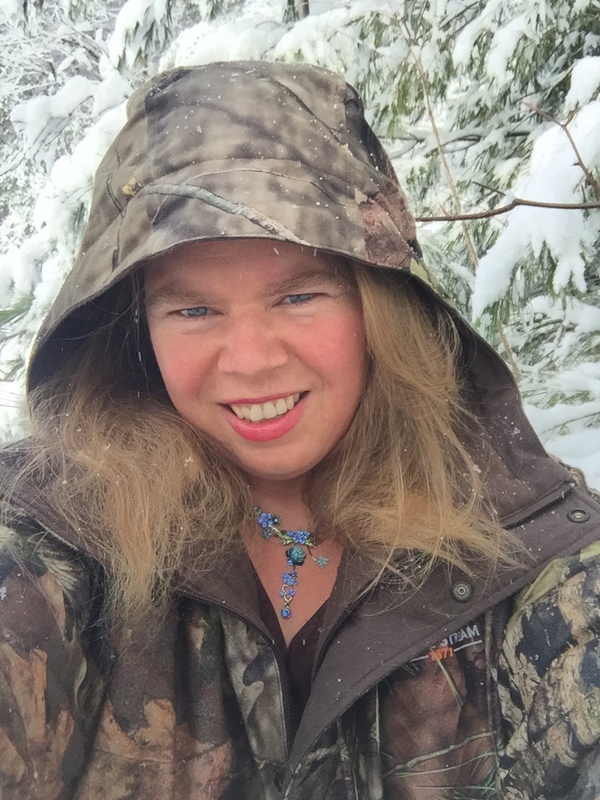 She is hunting with her family every night in the hopes of catching a meal. Huddling in close against the biting cold. It’s the weekend again. I wake up with the sun shining in the bedroom window through the trees. I dress and head outside. What have my wild neighbors been up to? The coyote seem to love tracking through the field between the forest and the wetland. And this morning I found tracks everywhere. I did not find evidence of a kill, not even a mouse. It was like they were playing. Trotting then jumping into the newly fallen snow. An imprint of a smaller body. I am sure there are yearlings in this pack. There I said it. Yes, a pack. Coyotes can be solitary creatures but over the years, more and more I notice family groups. One or two sets of tracks that fan out and return together. Coyotes can do something in their step called direct registration. That means their back feet fall into their front feet tracks. It can make them appear two-legged. 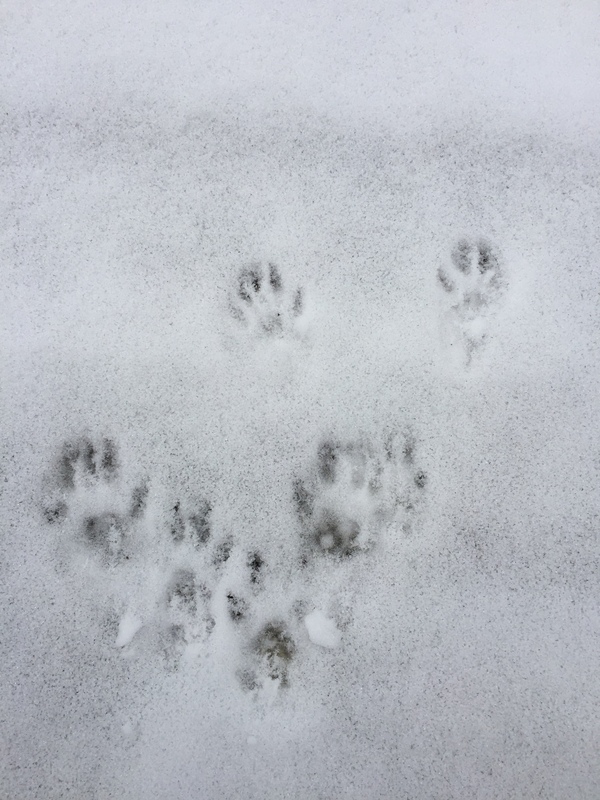 And it can make a few coyote appear to be one – until you see the tracks fan out and you realize you were following a family. Deer can do this too. But the coyote were not following deer that night into the field. They are very familiar with this field. But what drew them out last night to howl to the dark sky? And despite the freezing temperatures, what inspired the yearlings to play and not conserve energy? 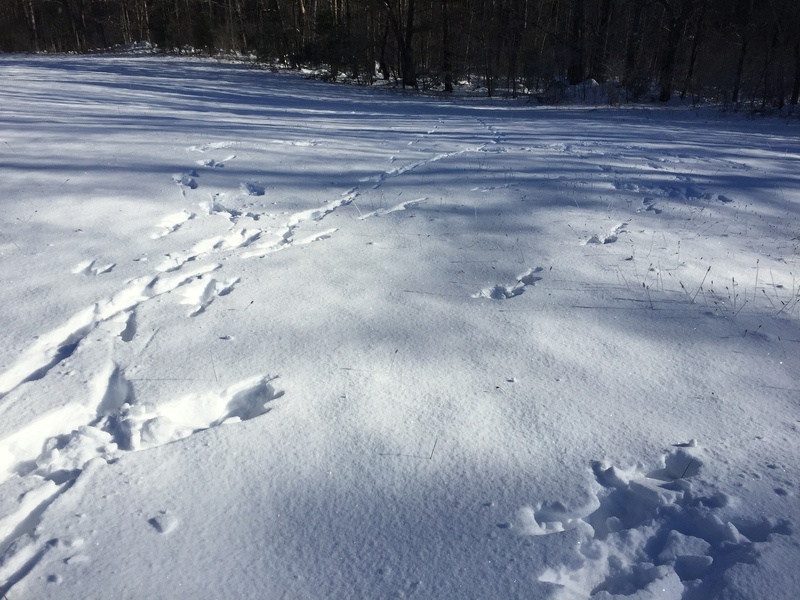 Two sets of tracks came out of the forest but at least five explored the field, only to congregate again as they left the field to the southeast. I tracked one set of prints back into the forest only to observe them fanning out again. So many options. Where were they going? Back to a den? Where did they sleep during the day? Tracking my wild neighbors answered some questions, only to give me more. Sometimes out here in the field you need to leave your questions to the mystery and then head inside for some hot chocolate. But always head back out! Warm up and go back in to the outside! 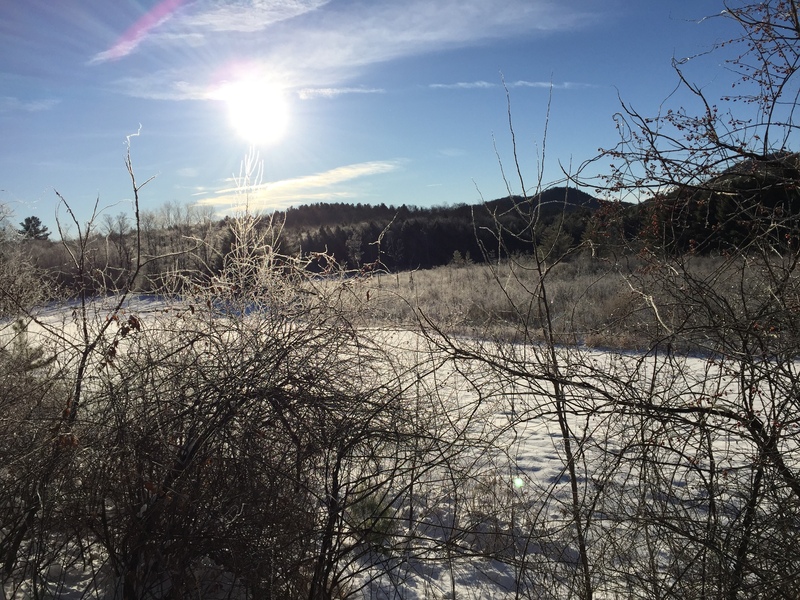 Into the Outside is a bi-monthly feature in the Ashfield News and Shelburne Falls & West County Independent. This article appears in the January 2018 edition of The Ashfield News. 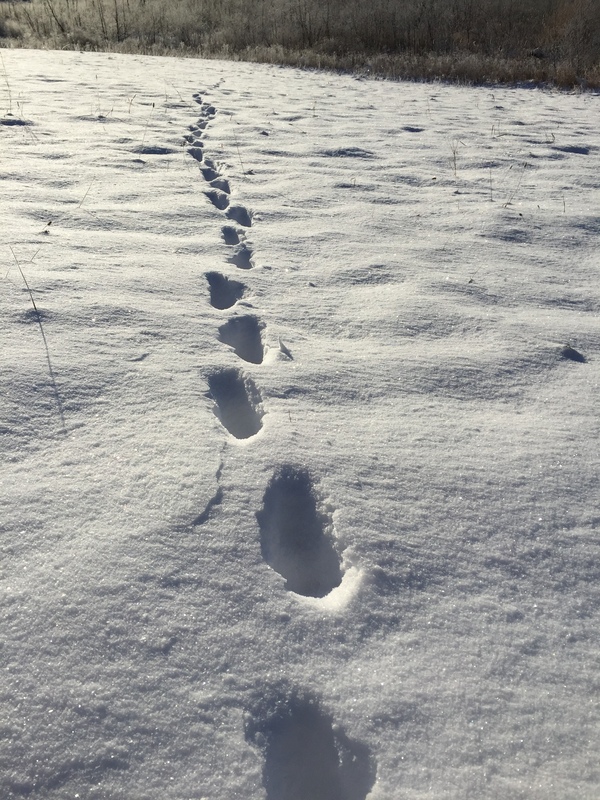 This entry was posted in Natural History, Natural Science, wildlife tracking, Winter and tagged Animal tracking, animals in winter, Arianna Alexsandra Collins, Chickadee, Hearken to Avalon, Into the Outside, wildlife tracking, Winter. Bookmark the permalink.